Snowfall on March 21, 2018 in Martinsburg, W.Va. Snow fell Tuesday night and continued Wednesday afternoon, making travel difficult in some areas and leading several school systems to cancel classes. Residents in some snow-bombarded areas of West Virginia were told to stay off the roads to allow crews to treat them. Joe Castaldo, the state Department of Transportation's Berkeley County supervisor, told the Journal of Martinsburg that numerous vehicles have slid off roads or become stuck on hills. Castaldo suggested that people stay home if they can. "If they have to be out, then try to stick to main primary routes and only go if you have four-wheel drive vehicles," he said. FirstEnergy said nearly 10,000 customers in northern and eastern West Virginia were without electricity on Wednesday, while Appalachian Power said more than 7,000 customers were without service in southern West Virginia. 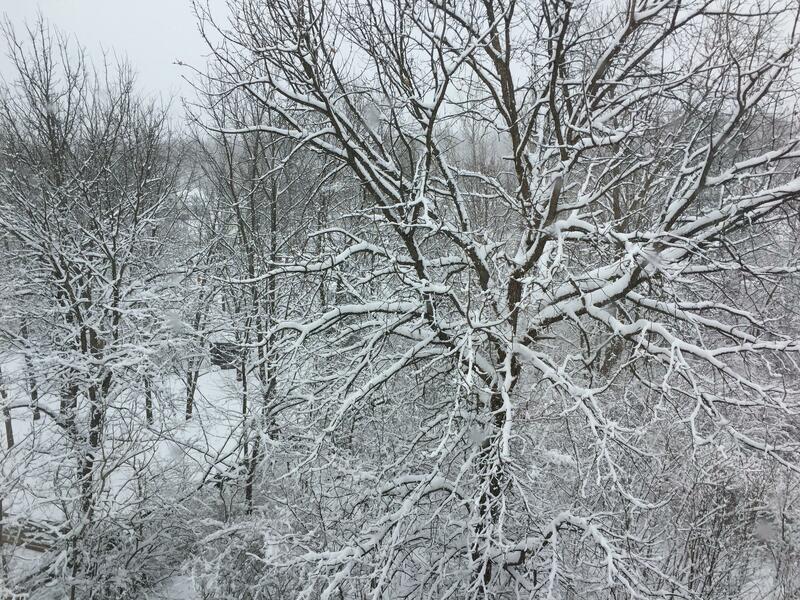 In Louisville, Kentucky, heavy, wet snow fell at the rate of about an inch per hour, snapping tree limbs. Kentucky Transportation Cabinet spokeswoman Andrea Clifford said crews were salting and plowing roadways. For some areas that have dodged snowfall this winter, it was the first major storm. Sarah Schottler, who runs Blakeley Street Bakery in West Virginia's Eastern Panhandle community of Charles Town, said a vendor show in Maryland where she was supposed to promote her products was canceled by the storm, but that freed her up to get some Easter cookie orders filled at her shop. Her two children got a snow day off from school Wednesday after about 8 inches of snow fell. More was still coming down. "It's definitely our only one for the year," Schottler said. "I feel like a lot of people were kind of OK with it because you spend all winter wondering if we're going to get any and we really didn't get anything. And you know it's the last one. So it's like the light at the end of the tunnel." Some of West Virginia's ski resorts are enjoying an early spring surge after a warm February, said Joe Stevens, spokesman for the West Virginia Ski Areas Association. The storm has especially benefited a pair of cross country ski areas. Whitegrass Touring Center in Tucker County and the Elk River Touring Center in Pocahontas County should "finish the season strong with excellent conditions," Stevens said. During an eight-day stretch in mid-March, 70 inches of snow fell at Snowshoe Mountain Resort, and that was before the current storm hit. The resort had 40 of 60 trails open Wednesday and plans to keep them open through the end of the month. The storm came too late for skiers hoping to get in one last run at Timberline Four Seasons Resort and Canaan Valley resort, which had already shut down its slopes. In southern West Virginia, Winterplace Ski Resort suspended operations after last weekend and plans to decide whether to re-open for slopes this weekend.